Have you purchased Solar PV / Solar Panels and the earnings and savings received were not as you were promised? You could be entitled to claim compensation. We are only able to pursue claims on a no win no - fee basis where finance for the goods has been arranged directly through the merchant and the lender has paid the merchant directly as claims are made against the lender because merchants often cease trading before any refunds or compensation can be recovered. Where a loan is arranged by the merchant through a lender affiliated to them then the lender is jointly and severally responsible and a claim can be made against the lender. 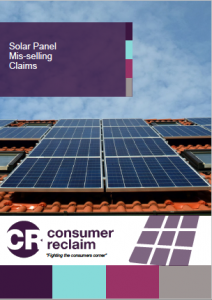 Most of our claims against Renewable Energy companies who have Mis-Sold Solar PV systems involve direct sales companies making unrealistic promises that are a far cry from reality. Our dedicated team of legal experts will challenge both contractual and verbal misrepresentations and where required we bring in expert witnesses to support our client's claims on a no upfront fee basis. We obtain a survey entirely paid up front by ourselves that is only billable to a client upon a successful claim. - Our surveys generally reveal hidden issues with client’s PV systems exceeding £5,000 to rectify. - These issues are becoming more serious over time and if left untreated can result in escalating costs and even the failure of the systems. This can lead to clients having no recourse from the solar company who sold the system if the solar company has ceased to trade. - Not only do we hold any lender who has financed the purchase accountable for the issues with the solar system but the majority of our surveys demonstrate little benefit in purchasing the systems after repaying the finance. As such we can obtain remedies such as full refunds of all payments made and loan balances being entirely written off. - Where lenders are made accountable for the issues we can also make them honour the warranty periods that would have prevailed if the solar companies were still in business thus providing peace of mind for our customers for the future. All of the above pursued by us on an entirely No Win – No Fee basis with all up front costs met by ourselves!